This pump is made by using the lasted technology, product performance is stable, compact design, small volume, light weight. It is convenient to install and carrying, simply pump and car battery and battery can be connected. Widely used in: all kinds of paver, digging machine, construction machine, bridging machine, roller, oil tanker, etc. Convenient disassembly, repair, replacement, can achieve the purpose of repeated use. 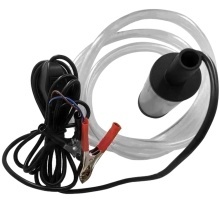 This pump is suitable for transporting diesel, kerosene, water. Oil pump+ Water pipe, high quality PVC soft tube. Pump diameter is 38mm, the pump flow rate is about 30L/min, Head 3 meters. Continuous use time is recommended to be less than 30 minutes to avoid burning the motor. Explosion-proof, impact-resistant, high-temperature, leak-proof design, to ensure no water leakage. After the motor is closed, the pressure is above 190KPA. Large displacement: 450ml/10s, High temperature resistance: 80 degrees or more, Resistance to low temperature: -25 degrees. Service life more than 25,000 times. 1. The pump is prohibited pumping gasoline, alcohol and other flammable liquids! Can not load and run dry pumping. 2. The pump should be intermittent work, pay attention to work for not long time. 3. Before use should confirm whether the power and pump labeling voltage line, voltage tolerance±5%, note the positive and negative pole.